Stourport-on-Severn is a long way from the sea, but has the atmosphere of a true maritime holiday resort. Not surprisingly people from all over the region have been coming here for many years for a fun day out. At the peak, Stourport was one of the busiest inland ports and to service increased traffic, a complex series of interconnecting basins evolved at the junction of the two waterways - the River Severn and the Staffordhsire & Worcestershire Canal. Today, these present a fascinating historic heritage landscape. The Canal & River Trust provides over 50 moorings across the upper and lower basins and a range of facilities are available (please see individual mooring descriptions for more details). The town basin at Stourport is between the River Severn and the Staffs & Worcs Canal, close to Stourport town centre. The basin occupies a large proportion of the town centre. A one way system operates around the A4025 Bridge Street and York Street. Mart Lane runs between York Street and Severn Side. The moorings are located approximately 100 metres on the right from the junction of Mart Lane and Lichfield Street. Electricity stanchions are adjacent to each berth. Electricity is provided by Smart Meters where electricty is purchased via an online account. There are three shared water points on the pontoons. There is a facilities block, shared with passing boaters, in Mart Lane approximately 100 metres from the site. There are public car parking spaces next to the moorings. Space cannot be guaranteed and is on a first come first served basis. The moorings are secured by a gate with a combination lock. 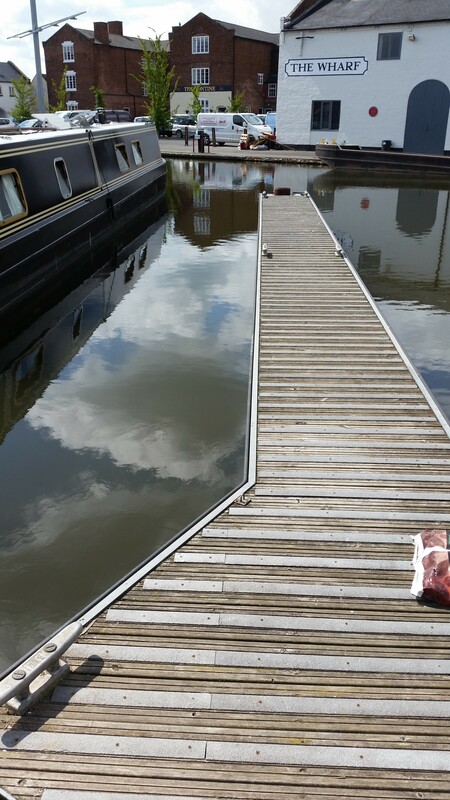 The moorings are against a floating pontoon within the popular confines of the Stourport Town Canal Basin. Mooring cleats are spaced at 5 metre intervals. There is a selection of shops, banks, a post office, pubs and public amenities within 5 minutes walking distance at Stourport town centre. Bus services run via Kidderminster & Worcester. Please contact the Mooring Manager for an appointment to access and view this site.